When this game released it was to an instant firehouse of disdain and mockery, with never-ending videos of goofy animations and awkward glitches filling up the news of Mass Effect: Andromeda. Some of my cohorts reported also being less than satisfied with it. 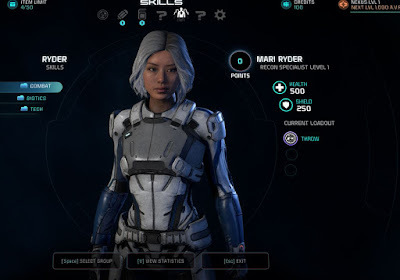 I tried the PC version briefly (before the wave of patches that released) and was met with a combination of some glitchy behavior and characters who didn't sync well with their environment, as well as the harsh reality that the lead female character (Ryder the sister) looked....well....weird. So the good news as I see it: the patches seem to have fixed all the animation issues I had noticed on PC, or at least Xbox One certainly doesn't have them. The graphics are sharper than I could get on my PC edition (I have a pretty nice rig but ultimately some games are just designed to run and play more smoothly on console) and the HDR effect on the Xbox One S is a nice touch. 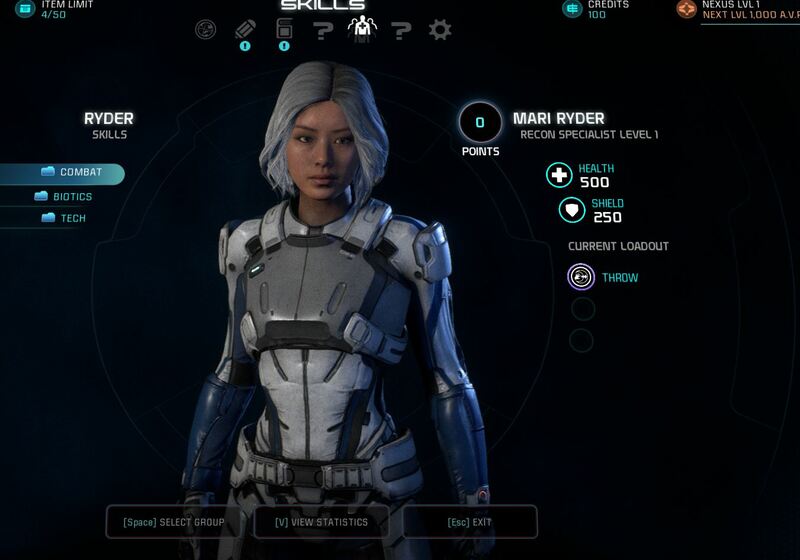 The character models are not bothering me this time, although I didn't even both to go for Ryder's default animation and made her a distinctly more asian gal with features that are less off-putting. The first time I tried the game I felt like the rush to get people down to an alien world (Habitat 7) and in to a firefight was a bit too contrived and worked against the intended grain of the tale (colonists from an entire other Galaxy, showing up to their new home fully armed and ready to rumble). Now giving it more time and many more hours in I have to say...this feels like a pretty decent game to me, with all of the "Mass Effect bells & whistles" I like. But given how much everyone crapped on this game (and on ME3 previously, which I also liked), I guess perhaps the IP was doomed in the eyes of the teeming masses before it ever had a chance. 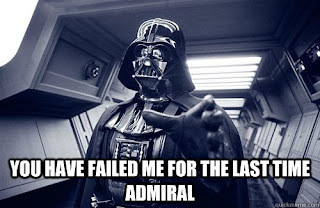 EA releasing it with obvious animation and character issues was icing on the cake. In the end, it just really amuses me that Destiny 2 is suddenly the darling of the hours, ME:A remains one of the more excessively reviled games for "reasons" and so the internet trundles on. Not that there's anything wrong with Destiny 2.....I have always been a Destiny fan, too; but Destiny 2 is really not any different than its predecessor....other than the fact that it had immensely better marketing and apparently knew how to target the fickle gaming audience just right. Go figure.....either way I win, though. Well, except for the fact that EA/Bioware may have cancelled future ME plans indefinitely. Sigh. Maybe next time they can get Nathan Fillon to voice act a snarky, charming rogue robot and then rake in the dough. Fillon = profit! I only recently learned of the Zweihander RPG, from Grim & Perilous Studios, but let me tell ya...this thing's a beast! 2017 is shaping up to be a very interesting year for alternative fantasy RPGs and this one is no exception. At 692 pages this is a monster of a book, but from scanning the PDF it appears to be very complete. Zweihander appears to be an "inspired" retro RPG based on classic Warhammer Fantasy Role Play (mainly 1st edition and 2nd edition influence it looks like). For those of you unfamiliar with this style of fantasy RPG, it's nestled deep in the grim, gritty and dark domain of a grimy, plague-ridden pseudo-Europe where life is both cheap and hard. I've got the PDF but the POD is on the way, after which I'll have proper time to absorb it (let's me catch up on Dungeon Fantasy while waiting). 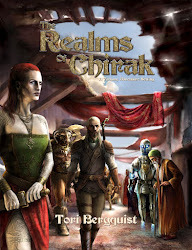 I'm not sure how much longer this promotion is on for, but if you'd like the print edition go support Tenkar's Tavern through this link for a specialoffer on the print copy for only $44.99, which is discounted from $59.99. Also, the PDF is only $13.00 right now. This one's a no brainer! Getting it, backed. These modules are incredibly functional and extremely easy for a time-strapped GM or a GM who just needs "that thing" to drop on the map somewhere. If you're in to hexcrawling this book provides a lot of utility, too. 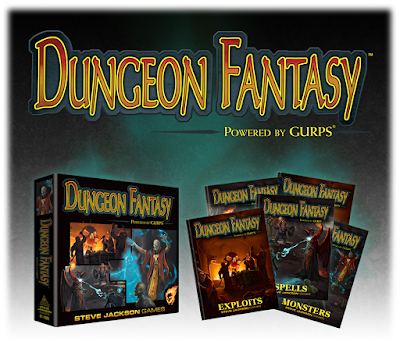 My Kickstarter set of GURPS Dungeon Fantasy, including the Companion and GM Screen, arrived today. It's a monstrous set: the box is HUGE in traditional over-the-top Steve Jackson Games form, with four core books, a module book, dozens of figurine stand-ups, the stands, dice, and two large maps. It's so much that I doubt I'll have time to absorb it for the next few days....but it is most definitely the GURPS experience, just pared down to the relevant Dungeon Fantasy bits. Off hand the book seems to cover most of what the DF line has presented in the past, but one can clearly gain additional benefit from many of the other DF modules out there (I noticed for example that there are only a few racial options in the boxed set). Speed 30 feet (40 feet when running on all fours). Scent: Wolven are gifted with exceptional noses and this grants them advantage on any roll to track or detect a target in which scent could play a role. The target could be up to a week old and the wolven would still gain this tracking benefit; if the target is more than a week old, or recent rains have eliminated evidence of the scent then the advantage may disappear (at GM’s discretion). Quadruped: While running on all fours the wolven gains a Speed of 40 feet. Wolven can shift to all fours as part of a move action, and can also stand back up in the same move action for a 5 foot cost. Scent: see details above; grants advantage on any perception or survival skill related to smell and tracking. Bite: wolven can bite as an attack, dealing 1D4+STR modifier damage. This is considered an unarmed attack. 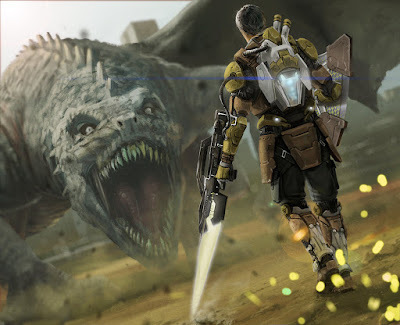 Run on All Fours: the wolven are ideally suited to running on all fours, and build leather armor with slings to let them carry weapons easily and without hindrance while running. To many men, this has made wolven look like they transform into wolves, but in fact the wolven are simply adept at moving this way. While running on all fours the wolven gains a Speed of 40 feet. Wolven can shift to all fours as part of a move action, and can also stand back up in the same move action for a 5 foot cost. Dark Vision: Wolven have dark vision and can see exceptionally well in starlight. Attribute Bonuses: Wolven gain a +1 to Dexterity and Wisdom. Languages: Wolven know their native tongue (vyrkashan) and one of two possible human tongues: the northern tongue (Zarnian or Autrengardian) if they dwell in the Deep North or Middle Tongue (common) if they dwell in the southern reaches of the Deep Wilderness. Wolven of other worlds know common. 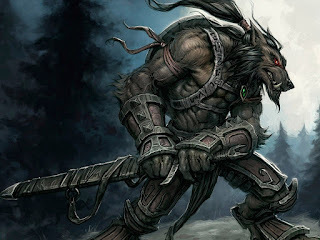 Vyrkasha wolven are indigenous northern beastmen who dwell in the region known as the Northern Wilderness. In the Era of Strife the wolven are engaged in a fierce territorial battle with gnolls who seek to gain control of the vast peninsular region. The wolven are strong but hampered by being divided over seven tribes. Still, the tribes often work together against the demon-worshipping gnolls. Wolven structure their tribes around a chieftain, and usually among every 10-15 chieftains a warlord will arise who serves to coordinate and protect the tribes and families in his domain of control. There are currently seven “kingdoms” in the northern Wilderness. Wolven regard the deity Wolfon as their creator deity, but they also pay reverent dedication to the Emerald Queen, a great Dragon which dwells in the Emerald Green of the deep north, and is believed by some to be the Brood Mother of all dragons. Others say the Emerald Queen is favored daughter of ancient Hazyk, who dwells in the Domain of his own name, and is believed to be a ten-thousand year old direct son of Tiamat. Vyrkasha priests of Wolfon tend to be cleric/rangers while those who serve the Emerald Queen are usually druids. Most adventuring wolven are known to be barbarians and rangers. A few wolven bards exist, calling themselves skalds as the Austrengardian bards do. The name Vyrkasha is the title wolven ascribe to their own kind, and means "the people" in their own tongue. Wolven is the title applied by the men of the north and south. 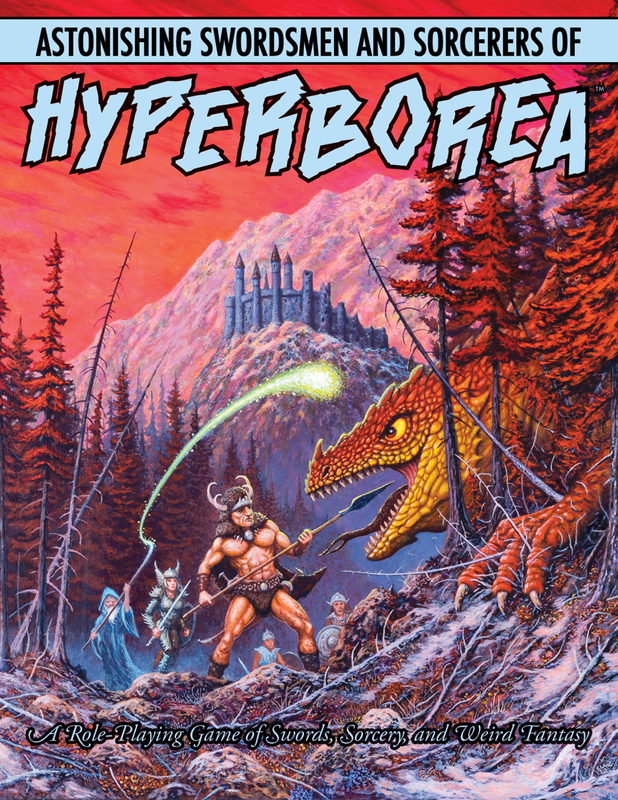 Just discovered an email with my complimentary code for the PDF of Astonishing Swordsmen & Sorcerers of Hyperborea 2nd Edition.....which means, at last, that the hard cover is not too far away!!! If you don't have it yet and want the PDF, looks like it's on sale for $12.75 right now. At 622 pages it's a steal! If you stake your corner of the OSR on AD&D 1E and Robert E. Howard's influence on gaming, then ASSH really is a must-have. Those five books still take up half as much space as a single core rulebook for D&D or Pathfinder. And just like as above, the five books for White Star still take up less space than Starfinder Core or Traveller core. Add in some dice, a notepad and pencil and you've got yourself a game! What sort of OSR Surival Kits do you like to drag along? I could easily see one which covers The Black Hack (the most emminently portable OSR-derived game out there), or pretty much any of the Night Owl Workshop games (which are all utterly amazing). I've got a serious preference for digest books, and if I ever saw --say, Goblinoid Games-- produce a thick and portable version of Labyrinth Lord I'd totally snag that sucker. Short post, but I just wanted to say that this year has been sufficiently taxing* due to a mix of work, family health and school issues (all the stuff I don't normally talk about on the blog!) that I have really grown to appreciate the idea of system loyalty....that fabulous notion of sticking hard and fast to just a few game systems that you grow to know extremely well. It also helps that there are so many games out there now that hit the sweet spot for me in terms of the right level of mechanical detail with the right level of prep time requirements. Dungeons & Dragons 5E is a no-brainer here; you can spend an hour prepping and have three or four sessions' worth of material ready to go. Using stats from the rules is simple, prepping on the fly a piece of cake. Call of Cthulhu 7E has become my de facto preferred edition of Basic Role Playing. The new mechanical contrivances, from bonus/penalty dice to the new skill approach (the normal/hard/extreme/crit ranges) are so useful and intuitive that it's hard to imagine a future edition of BRP that doesn't use this approach. I really can't stress enough how much I like the changes in this new edition....it's been a much better overall play experience. Traveller remains the best and easiest procedural RPG and remains un-dethroned in this capacity. The 2nd edition of Mongoose's version really has managed to hit that sweet spot for SF gaming. Savage Worlds remains, as ever, the best pick-up-and-play anything system you could possibly ask for. Swords & Wizardry White Box (specifically this White Box) will remain on my shelf forever as I wait patiently for a time to convince my group to go retro for a while. Likewise White Star will forever be my favorite OSR title and the best pick-up-and-play experience I've had. My weekly games right now consist of a rotating D&D 5E campaign on Wednesday (we have one group exploring Galvonar one week, and another group exploring the Western Nakamura Isles and Mataclan the next) while on Saturdays we've been sticking exclusively to a long-running Call of Cthulhu campaign aimed at a vaguely Twin peaks vibe but 100% pure mythos in origin. We have two Traveller campaigns, one for each group, currently on hold but with plans to revisit the moment one of the active games hits a good pause. I do dive in to new stuff when I can find time....I've enjoyed checking out FATE Core even though it remains outside my comfort zone (a bit) and I have recently been really enjoying reading the Symbaroum RPG, for example. I've even valiantly tried getting in to Starfinder although I concede that the rulebook induces fatigue and the game system itself, being Pathfinder, remains a tough sell for me to engage with anymore....it does not meet the aforementioned criteria of the "right level of mechanical detail relative to prep requirements" that I need....but it is interesting. *so bad that I still haven't had time to fire up Destiny 2 yet!!! Looks like I need to turn this on....the current post has been getting spam blasted for a few days now by unsavory links. I'll try to be prompt in reviewing comments! As it turns out Destiny 2 day one patch was about 7 GB in size which meant I didn't have enough time to play it last night since it was too busy loading on the Playstation Network's notoriously slow upload rate. Sigh. So here's a few random things! Starfinder is pretty cool I've decided, but it took me a while to figure out how I wanted to use it. 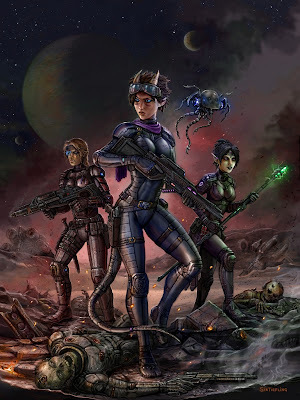 The game works well as a "fantasy D&D with the trappings of modern looking SF" but that's actually a genre that doesn't quite exist in the form Starfinder is pitching. The last time we saw anything like this it was Fantasy Flight's Dragonstar expansion for D20, and that was close to 15 years ago. The conquest of Pellamorda – the Star Empire of Corgastin Grace has spread throughout the Etherworlds, the region of space which has over many years grown to encompass most of what was once called Wild Space or Chaos Space. 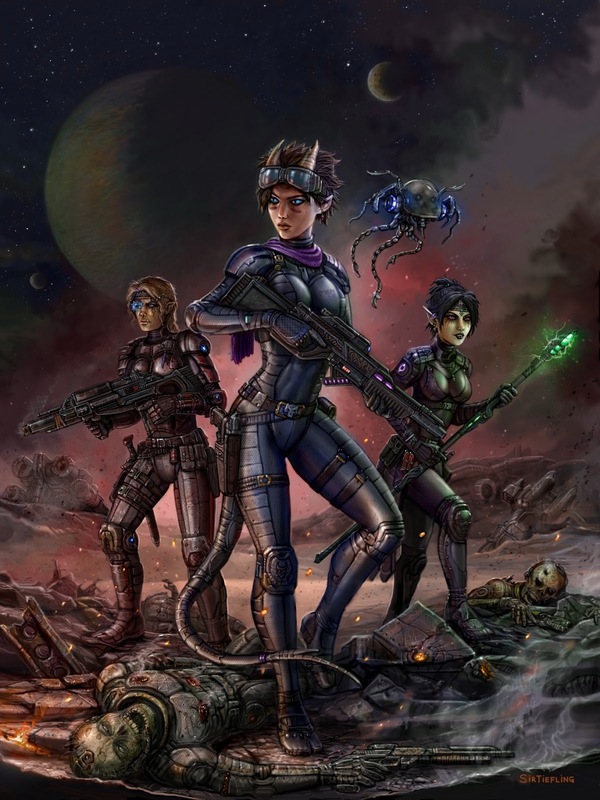 The Star Empire is dominated by a confederation of four species, including the Wysentrien Elves. 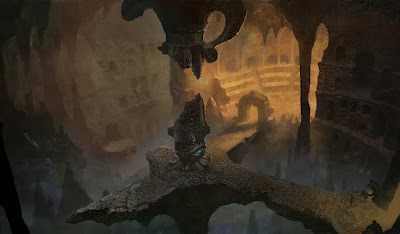 The emperor is the Immortal Astrokan, undying ruler of the Etherworlds of Corgastin Grace. Pellamorda is a nondescript world of pre-tech societies which were locked in a conflict between good and evil. Lord Vathamre, a disciple of chaos and son of demons had uncovered an ancient artifact called the Star Crystal, a device which granted immense power and insight. The device, I turns out, was also coveted by Astrokan, and his stellar navy was sent to recover it….and in the process they laid waste to Pellamorda and enslaved the world. Five years in to the occupation of Pellamorda, the Coalition of Independent Worlds launched a covert operation to free Pellamorda and learn if there was any way to destroy the Star Crystal….a team of elite agents were sent to explore the mysteries of how one of the Infinite Sphere’s most powerful artifacts cam to rest on a remote world of completely nondescript nature….. This campaign takes place in 3503 AW and Lingusia is a remote backwater world! The last time wild space was visited in Lingusia (at the heart of Chaos Space) was in roughly 2090 AW, during the Age of Strife. This early era was a period of expansionism for the arcane elves known as the Naelythians, noted for their deep blue skin. Other entities of the era vied for power in the dawn of space exploration which was driven purely by magic. It was not until events which took place between 2090 AW and the present (3503 AW, the Era of the Warlords) that any of the denizens of Lingusia would be exposed to the stellar culture of blended technology and magic which arose over the following fifteen centuries. In this time, the Naelythian empire rose and fell and now exists as outlier colonies in the Outer Expanse of the galaxy. The development of more sophisticated FTL drives which did not require magicians as human batteries led to a dramatic shift in the power structure of the universe, and eventually the need to navigate from one system to the next via the use of the etheric crystal spheres became relic technology. As the first worlds to develop true technology ascended in to space, the power dynamic shifted, and by 2500 AW as time is reckoned in the Hyrkanian Empire the era of old wild space was a lost memory. A thousand years later the Star Empire of Corgastin Grace has risen to power, obliterating dozens of other contenders in the process. At this time, Lingusia remains a forgotten system in an obscure corner of the galaxy, but –as with Pellamorda—it is only a matter of time before Astrokan turns to it to loot the world of its ancient relics as well. In this era, Lingusia is clearly evident as a construct world: it's immense flat plane (more closely resembling a slightly rounded object like a glass token) is evidence of immense construction by cosmic beings capable of constructing whole worlds, and is key to the mystery in its origins as to who built it and why. When scholars of the Empire or the Coalition at last take notice, then it may indeed pose a grave threat if they learn of the true nature of the "planet" as the prison-construct housing a dozen primordial cosmic entities called the Skaeddrath. Anyway, by doing it this way I manage to keep continuity with what has come before in the campaign and also place it contextually in the lengthy documented history of my most venerable setting (Lingusia), in a timeline that won't even remotely interfere with the ongoing fantasy campaigns set in the 2090s while at the same time getting a chance to revisit, potentially, the Warlords Era of the 3500s. Ironically it's not actually "out of canon" for me to do this. Technically my first weird Science Fantasy games in Lingusia took place in 1984-1985ish when I ran a series of games in which the intrepid adventurers of the time (including my sister's rogue Wormi) were dealing with space raiders from at least five hundred years in the future, coming to Lingusia from a time when high tech spaceships were normal. It was never clearly established if the future of Lingusia included SF trappings when I ran that campaign but it was clear they were aliens who wanted to harvest the past for their diabolical interests. One of the byproducts of that campaign was the implication that doppelganers were actually aliens trapped on Lingusia (a nod to my appreciation for the shapeshifting wraiths of the Rom comic). I'd later also work out that the mind flayers (hyshkorrid) were very much in the same boat, aliens trapped on Lingusia (by design or accident has never been revealed). When Spelljammer came out I loved the concept but had to assume that the campaign I had run years earlier was either an anomaly, or some weird timeline, or that it was just a mystery to be resolved at a future date. I now feel kind of like maybe, perhaps, Starfinder provides a great way to revisit that conceptual space and also expand upon it, as well as providing some "closure" to the mystery of the relic-stealing future space pirates from that particular campaign!